Sweet, tender crab legs make a luscious meal -- and they are also a low-fat, low-calorie, high-protein seafood choice. For example, a 3-oz. serving of Alaskan king crab, popular because of the amount of meat in its legs, contains 16.45 g of protein and only 82 calories and 1.31 total g of fat. 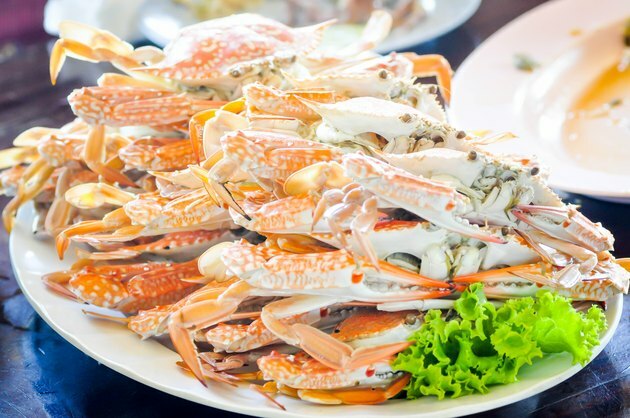 To preserve their freshness and taste, crab legs usually are sold precooked and flash frozen, making them particularly suitable for reheating in your microwave. Thaw 1/2 to 1 lb. frozen crab legs for each person in the refrigerator for about 8 hours. Although they will keep for up to 2 days in the refrigerator, the faster you cook them after thawing, the better they will taste. Separate the legs into groups of three. If the legs don't fit in your microwave, cut the claws off at the joint with kitchen scissors. Wrap each group, along with a sprig of dill, in damp paper towels. This provides moisture to help steam the legs. Then, cover with plastic wrap to prevent steam from escaping. Microwave each bundle individually on high for 2 minutes. Remove the plastic and paper wrappings carefully to avoiding steam burns. Serve immediately. Serve crab legs with melted butter for dipping, or for a healthier side, serve with lemon wedges.